I wasn't really sure what color to use on my next pattern. I'm trying to cut down on purchasing any more until I've used what I already have. The problem is that I have so many partial skeins that it looks like I have more than I really do. But I found 2 skeins of this lovely pink and decided this would be next. Only to run out when I was close to finishing! So I actually did end up having to go get an extra ball from the store. While I was working the center, the first section came out so great that I wondered if I could just repeat it endlessly. I did repeat it one time before I changed it up and added the strips for more texture. So the center section repeats itself one time before you reach the midway point. After working the strips, I wanted to work something similar to my last pattern, Selah-- lots of FPDCs. I was initially going to add some spaces in the center of the leaves, but found that I enjoyed popcorns there much better. 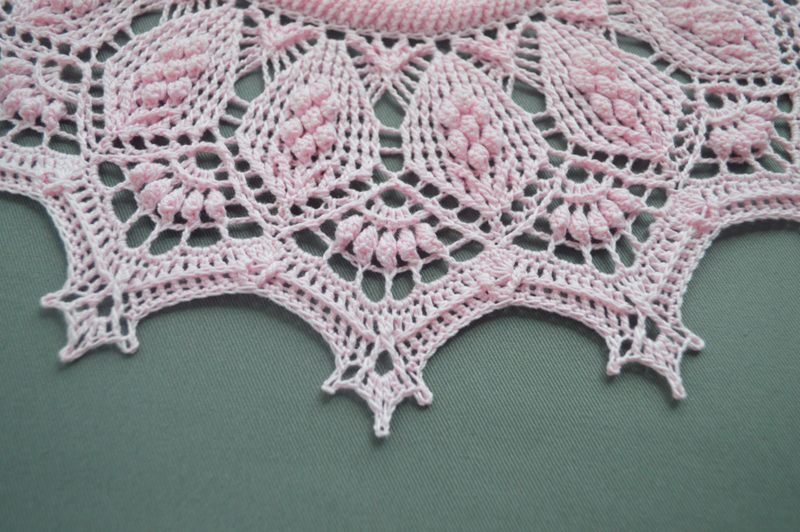 I used 64g/360y/330m of Red Heart crochet thread in pink. This is usually one of the few colors I can get at Walmart. I used my 2.25mm Furls Odyssey hook, which is my current favorite hook. This piece came out to about 14-inches in diameter. If you want to purchase the pattern, you can use any of the links below. The black buttons will purchase directly from me, while the Ravelry button will allow you to purchase from Ravelry.